Wash and slice the zucchini. I like to cut them under 45 degree angle to get elongated slices. Grill them lightly on both sides and set aside to cool down. Take your cottage cheese in a small bowl and add you preferred fresh herbs with salt & pepper. Mix it all together. Taste it. If necessary repeat. 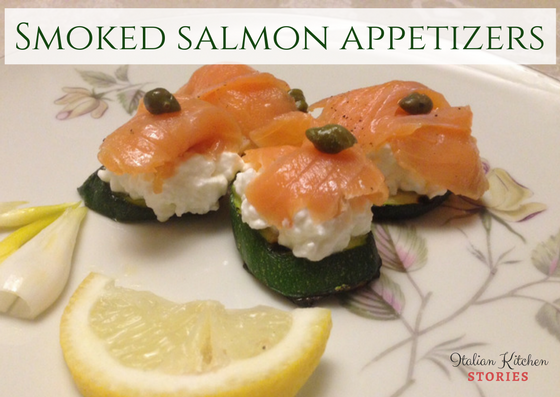 I personally like my smoked salmon appetizers not too salty but rather fresh. Place the grilled zucchini on the plate and with a small spoon add cheese. Now take pieces of salmon and place it over the cheese. 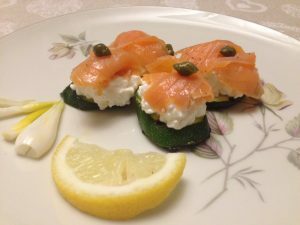 If you want, you can decorate it with some capers and serve your smoked salmon appetizers. 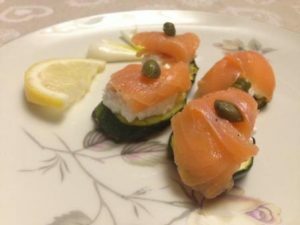 This is a light appetizer you can serve for lunch or dinner.